Afternoon, Thrifties! As we head into the weekend there are some good deals, sales and freebies about, so here is a round-up of a few that have caught my eye. To the more macho readers: if handbags and make-up aren’t your things, stick it out until the end to find out about how you can get your mitts on a free PC World giftcard. 2. 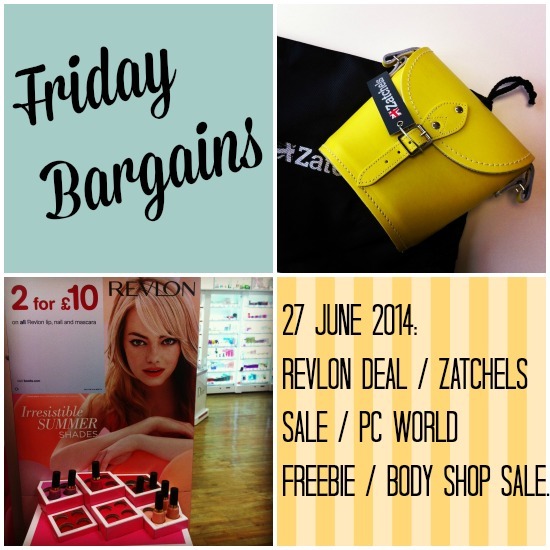 Boots: two Revlon lipsticks for £10. Boots is currently offering a good deal on Revlon make-up: £10 for any two products from its lipstick, mascara and nail polish ranges. Seriously, does anybody buy full-priced Body Shop products these days? Not that I’m complaining: the retailer has just launched a 40% sale, so it’s a perfect time to stock up on Christmas presents – as well as favourites such as the banana conditioner and Vitamin E night cream. Register with the cashback site Top Cashback, and get a £10 e-gift card for Currys and PC World. Sign up here, then follow the link through to Mighty Deals (a deals website), where you can purchase a £10 gift card for £5. Once you have purchased it, Top Cashback will credit your account with £5 cashback – meaning that effectively, you get the £10 cashback for free. If you are already signed up to Top Cashback, you can still purchase the £10 gift card for £5 from Mighty Deals. So not as good as a free £10 gift card, but a free fiver isn’t to be sniffed at, is it? By the way, if you take up this offer, don’t forget to check out my guide to getting money off at Currys and PC World EVERY TIME. Body shop sale! I’m so excited! Seriously, they have many great products but they’re just so expensive! I’m glad they have a sale now, thanks for sharing this! Huge fan of Top Cashback, I think they are better than Quidco. Going to try The Body Shop discount code, I hope it hasn’t expired yet since I am seeing it pretty late. Is it just me or are the field titles like “your name”, “your email” etc slightly misaligned?